A number of Israeli military vehicles invaded on Tuesday evening, Teqoua’ town, east of the West Bank city of Bethlehem, and clashed with a number of local youth. 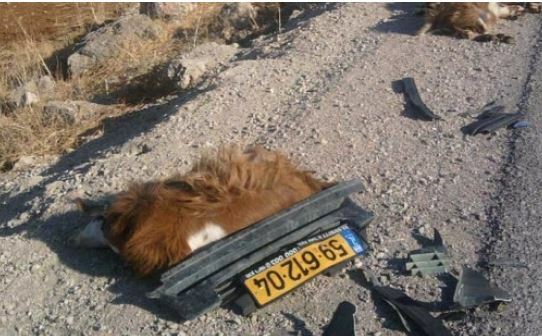 A settler’s car rammed a herd of sheep, killing eight, near Hebron. Local sources said that soldiers fired dozens of rubber-coated metal bullets and gas bombs, causing several residents to suffer the effects of tear has inhalation. On Monday, the army closed all roads leading to Teqoua’, an issue that pushed Palestinians to take alternate bypass roads, rough and unpaved, to enter or leave their town. 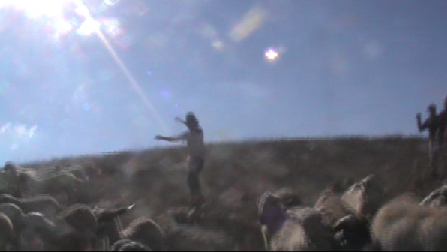 In related news, eyewitnesses said eight sheep belonging to a local shepherd were killed after being struck by a speeding settler’s vehicle, close to the Susiya illegal settlement, built on Palestinian lands belonging to residents of Yatta town, south of Hebron, in the southern part of the occupied West Bank. Coordinator of the Popular Committee against the Wall and Settlements in southern Hebron, Rateb Jabour, said the settler rammed 14 sheep belonging to residents Taleb and Ibrahim Mohammad No’man, killing eight sheep. Also on Tuesday evening, Israeli sources said a settler was mildly injured, when his car’s windshield was damage, after a number of youth threw stones at his car, as he was driving in Beit Hanina town, in occupied Jerusalem. Earlier Tuesday, soldiers kidnapped three Palestinians from the Bethlehem district while they were heading to work in occupied Jerusalem. On September 14th, two Israeli settlers attacked a Palestinian shepherd and two international near the Israeli outpost of Mitzpe Yair, in the South Hebron Hills area. During the aggression, the settlers stole video cameras from the internationals and broke one of their phones. Israeli police detained the Palestinian shepherd and one of the internationals for six hours. There were no consequences for the settlers. The South Hebron hills area has suffered from the presence of Israeli settlers’ since the 70′s. Eight Israeli settlements and outposts (among which Mitzpe Yair is one) almost completely isolate 16 Palestinian villages from the rest of West Bank. The settlers’ violence includes overt violent attacks on Palestinians and their animals, damages to private properties, and limitations to freedom of movement with many consequences on their daily life. Since the beginning of 2014, Operation Dove registered the arrests of 15 Palestinians, included minors, because they were on lands near the settlements. 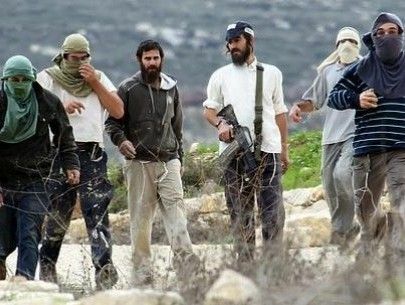 During the same period there were no consequences for Israeli settlers involved in the incidents occurring in the area. In spite of the violence suffered by the Palestinians from the South Hebron Hills area, they keep on grazing and farming on their lands, resisting in a non-violent way to the Israeli occupation. 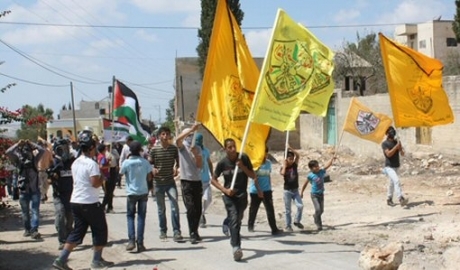 Boys and men of Kufr Qadum set out to the weekly Friday demonstration. 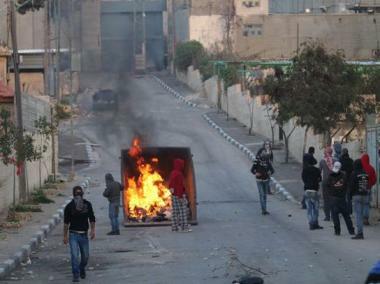 Kufr Qaddum was without the electricity since 11pm on Thursday night. Six villagers who are dependant on oxygen machines have been evacuated to the nearby hospital in Nablus. The following morning, at the Friday village demonstration, a young man was hit in the head by a gas canister and was taken to the hospital as well. Palestinian medical sources have reported that several residents have been injured, on Sunday evening, during clashes with Israeli soldiers invading the ‘Aida refugee camp, north of Bethlehem. Local sources said dozens of soldiers invaded the eastern area of the camp, and clashed with a number of youths, who hurled stones and empty bottles at them, while the army fired gas bombs, and rubber-coated metal bullets at the youths, and a number of homes. Medical sources said a number of residents received treatment for the effects of teargas inhalation, and received treatment by field medics. Also on Sunday evening, soldiers sealed the main entrances of Teqoua’ town, east of Bethlehem, and prevented all cars from entering or leaving it. Local sources said the residents had to seek alternate, unpaved, roads to reach their homes. The army recently escalated its assaults against the town, with frequent invasions, assaults against the residents and their property, and arrests. Two Palestinian children have been moved, on Saturday evening, to the Hebron governmental hospital, in the southern West Bank city of Hebron, after a number of extremist Israeli settlers sprayed their faces with pepper spray. Raed Abu Rmeila, a local human rights activist, said he moved the two children to hospital, after the settlers attacked them in Bani Dar neighborhood, in Hebron’s Old City. The two have been identified as Mohammad Makram Nawaj’a, 10, and ‘Odai Nasser Edrees, 12. He added that the settlers started organizing provocative tours, each Saturday evening, in different parts of the Old City of Hebron, under heavy Israeli military presence, and frequently attack the Palestinians. Some 800 Israeli settlers live in the city of Hebron, and around 250.000 Palestinians. The Israeli occupation forces (IOF) on Friday and Saturday morning opened fire on Palestinians’ fishing boats and family homes in the besieged Gaza Strip, in a renewed violation of the Egyptian-brokered ceasefire deal. Local sources said the Israeli gunboats opened machinegun fire at Palestinian fishing boats off Khan Younis and Rafah shores, east of Gaza, producing another flagrant breach to the terms of the truce. The Israeli gunboats further targeted Palestinians’ fishing boats off al-Sudaniya shore, to the northwest of Gaza city, eyewitness told the local SAFA news agency. The Israeli navy has frequently attacked Gaza fishermen since the ceasefire took effect, although Israel is committed under the truce deal to halting its attacks and expanding the fishing zone. 26 cases of IOF random gun-shooting targeting Palestinian fishing boats along with the abduction of six Palestinian fishermen and the misappropriation of three paddle boats have been documented ever since the truce was put into effect. Israel’s truce violations culminated in a round of limited incursions into Deir al-Balah, in central Gaza, for the third time since the implementation of the ceasefire deal. Along the same line, barrages of Israeli random gunfire, unleashed on Saturday morning, targeted Gazans’ family homes east of Khan Younis, to south of the Strip. An on-the-sport observer working for Quds Press said the IOF patrols, stationing at the Kissufim military base, north of Khan Younis, opened fire on Palestinian civilian homes and agricultural lands in the area. Huge losses have been wrought on the blockaded enclave ever since Israel launched its notorious 51-day military offensive on Gaza, on July 7. At least 2,155 Palestinian citizens were killed while thousands of others have been left wounded, mostly children and women. 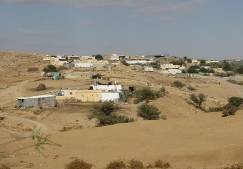 An Arab Bedouin man, from the Negev, was shot and seriously injured by Israeli army fire, on Friday, in an open area in the Negev. The Arabs48 news website said the man was shot in the chest and was moved to a hospital, suffering a life-threatening injury. The Israeli army claimed a number of Arab youths entered an area, “designated for military training” in the Negev, and “were engaged in an argument with the soldiers”. It added the young man was shot by a commanding officer following the alleged argument, that took place when he, and several young men, entered the area driving a vehicle. On its part, the army alleged that one of the Arab men “attempted to stab a soldier”, and was shot by two live rounds. The army frequently conducts live fire drills in the Negev, and in a number of areas in the occupied West Bank, mainly the Jordan Valley. Entire Bedouin communities are frequently displaced, while many Palestinians, including children, have been injured and killed, especially by explosive devices dropped by the military during training. Palestinian medical sources have reported, Saturday, that ten Palestinians were injured, one seriously, during clashes with Israeli soldiers invading Silwad town, east of the central West Bank city of Ramallah. 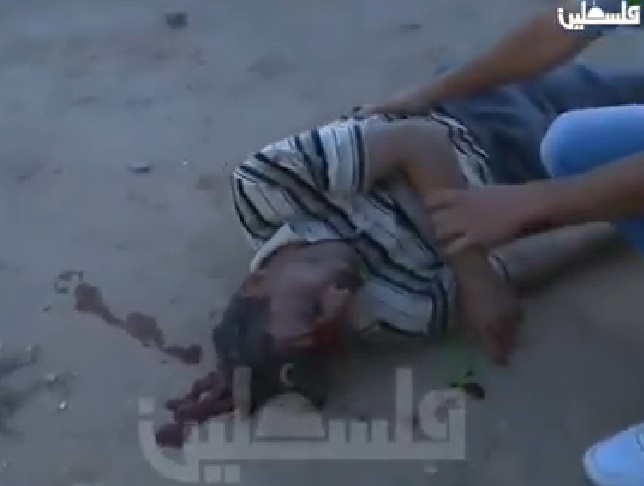 The sources said the Osama Bseiso, 37, suffered a serious injury after being shot in the head, from a very close distance, by a rubber-coated metal bullet, fired by the soldiers from a short distance. 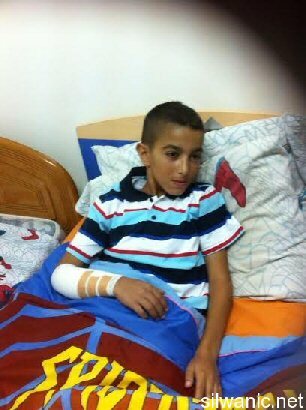 He was moved to the Palestine Medical Center in Ramallah. Around nine Palestinians suffered mild injuries, and received treatment at a local clinic in the town. In addition, soldiers kidnapped a young man, identified as Issa Farooq and took him to an unknown destination. Farooq carries an international license as a soccer referee. On Saturday at dawn, soldiers invaded Beit Fajjar town, south of Bethlehem, and Teqoua’ town, east of the city, broke into and searched several homes, and handed three Palestinians military warrants for interrogation. The three have been identified as Shakib Abed Hasan Taqatqa, 23, and Mousa Na’im Sheikh Taqatqa, 24, from Beit Fajjar, and Ahmad Riyadh Salah, 19, from Teqoua’. Several Palestinians have been injured, on Friday evening, and at least three, including a 10-year-old child, have been kidnapped, after Israeli soldiers invaded several neighborhoods in Silwan town, in occupied East Jerusalem. The invasion is the second on Friday. Local sources said that dozens of soldiers invaded Silwan town and drove around in its neighborhoods before provoking many Palestinians, an issue that led to clashes. Dozens of residents suffered the effects of tear gas inhalation, and many were shot by rubber-coated metal bullets. The Wadi Hilweh Information Center in Silwan has reported that the soldiers kidnapped a 10-year-old child identified as Odai Rajabi, along with two Palestinians identified as Samer Edkeidek and Ahmad Nader Odeh. 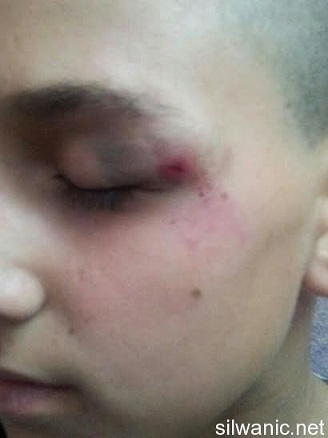 The Center said the soldiers violently assaulted the child before and after kidnapping him. Rajabi was in front of his home, playing with his friends, when the soldiers invaded his neighborhood; the soldiers struck Rajabi with their guns and batons, in addition to kicking and slapping him. Rajabi’s mother tried to stop the arrest but the soldiers hurled a concussion grenade at her. The child was released after being interrogated for several hours; he suffered various cuts and bruises, including a deep cut which required four stitches, close to one of his eyes. Israeli police arrested, on Tuesday afternoon, 12-year-old Muzeed Mohammad Abbasi after chasing a group of children as they were walking home from school, near the Old City of Jerusalem. 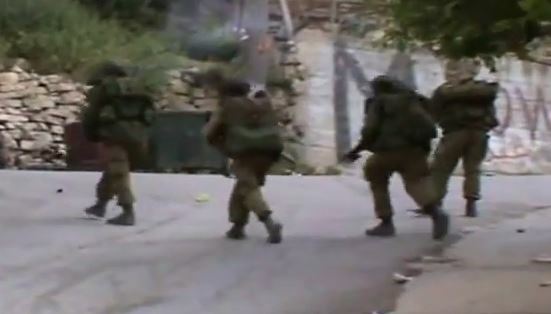 The Wadi Hilweh Information Center was recently informed that Israeli police chased a group of youngsters while they were walking in the neighborhood of Ras Al-Amoud, in the Silwan district of occupied East Jerusalem, in the direction of Ein Al-Lozeh. Forces took Mr. Abbasi to Salah Eddin Street Police Station to interrogate him on charges of throwing stones. The boy's family stated that the interrogation lasted six hours, with his father in attendance. Muzeed was then released on condition of house arrest for five days. The youth apparently fell to the ground, while being chased, leading to bruises in his hand and several wounds in his body. An ambulance team was summoned to check him during the interrogation, and Muzeed was taken to the hospital upon release; check-ups showed that he only suffered bruises. Israeli navy forces opened fire at Palestinian fishermen in Gaza early Friday, witnesses said, in the third incident off Gaza's coast this week. 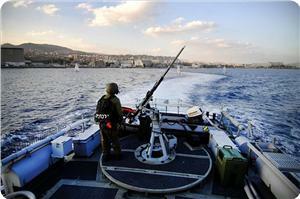 Naval boats opened fire at fishermen off the coast of Beit Lahiya in northern Gaza, with no injuries reported. Fishermen fled the area immediately. An Israeli army spokeswoman told Ma'an that "several vessels deviated from the designated fishing zone" and turned back after Israeli forces fired warning shots. On Wednesday, Israeli forces opened fire at a fishing boat which had allegedly gone beyond an Israeli-restricted fishing zone. A day earlier, Israeli gunboats intercepted a Palestinian fishing boat near Beit Lahiya and detained four fishermen from the al-Sultan family. The Aug. 26 agreement stipulated that Israel would immediately expand the fishing zone off Gaza's coast, allowing fishermen to sail as far as six nautical miles from shore, and would continue to expand the area gradually. The restrictions crippled Gaza's fishing industry and impoverished local fishermen. 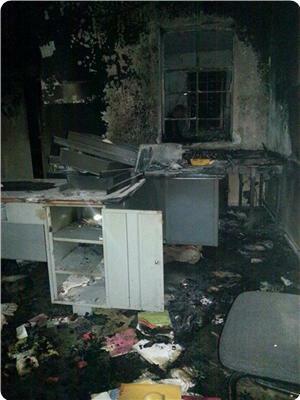 A Palestinian high school in Al-Sawiya village, south of Nablus, sustained severe damage at dawn Thursday when anonymous men, believed to be fanatic Jewish settlers, launched an arson attack on its building. Abdul-Rahim Suleiman, head of the municipal council in the village, told the Palestinian information center (PIC) that the attack had burned three rooms in their entirety and destroyed computers and scores of important files. Suleiman added that Palestinian fire trucks rushed to the scene and contained the fire. He said that the Palestinian police started investigating the incident, adding that settlers from Eli settlement are strongly suspected of committing the crime. About one week ago, Eli settlers stormed the school and clashed with students and employees before Israeli soldiers intervened and evacuated the assailants from the area. Israeli soldiers invaded the Fahma village, south of the northern West Bank city of Jenin, and kidnapped 26 Palestinians, including five brothers, and three more Palestinians in Hebron, in the southern part of the West Bank. The Jenin office of the Palestinian Prisoners Society (PPS) has reported that dozens of soldiers invaded Fahma village, south of Jenin, fired rounds of live ammunition, concussion grenades and gas bombs, before breaking into, and ransacking dozens of homes. Ibrahim Mohammad Nawasra, Mohammad Taiseer Nawasra, Mohammad Ahmad Nawasra, Ibrahim Hasan Nawasra, Khaled Nassar, his brothers Mohammad, Hamza, Imad and Walid, Mohammad Atef Mara’ba, Nidal Omar Mara’ba, Wajdi Mustafa Mara’ba, Nizar Omar Mara’ba, ‘Ayesh Mara’ba, Yousef Ayman Sa’abna, Shadi Hussein Sa’abna, Nathmi Bilal Sa’abna, Abdullah Ahmad Sa’abna, Nizar Omar Mara’ba, Ghassan Omar Mara’ba, Jawad Nayef Mara’ba, Ibrahim Hasan Majdeel, Abdul-Karim Adeeb Nawasra and Mahmoud Adeeb Hamdan. In addition, soldiers invaded Hebron city and Beit Ummar nearby town, and kidnapped three Palestinians, including a child. Local sources in Hebron said the soldiers kidnapped Mahmoud Majed Zghayyar, 24, from his home in Farsh al-Hawa area in the city, and Ghazi Saleh Erfa’eyya, 40, in Wad as-Samn area. The soldiers also invaded and ransacked several homes in Abu Kteila area, and broke into a cement masonry, and confiscated equipment from it. In Beit Ummar town, north of Hebron, soldiers invaded the home of Hussein Mustafa Abu Maria, and kidnapped his son Mohammad, 16 years of age, who was shot and injured by Israeli army fire last month, and is still in recovery. The soldiers also invaded Deir Samet town, south of Hebron, installed a roadblock at its entrance, stopped and searched dozens of cars while interrogating several Palestinians and investigating their ID cards. 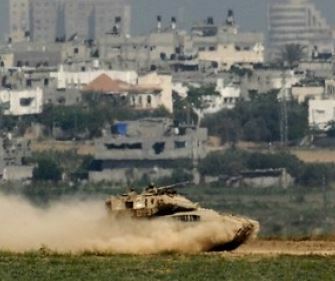 A number of armored military vehicles, and bulldozers, invaded Palestinian agricultural lands east of the al-Qarara town, near Khan Younis, in the southern part of the Gaza Strip, bulldozed and uprooted the lands, and fired rounds of live ammunition. Local sources said three armored vehicles, and four tanks, invaded the area, and advanced approximately 300 meters into the Palestinian lands before starting to bulldoze and uproot them. The sources added that the soldiers fired rounds of live ammunition at random during the invasion. The Israeli invasion is yet another violation of the ceasefire agreement that was reached under Egyptian mediation on August 27 following 50 days on ongoing bombardment and shelling of the coastal region. 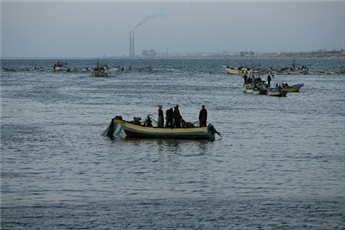 The attacks also include ongoing assaults, and arrests, carried out against fishermen in Palestinian territorial waters. Around 2137 Palestinians, including 578 children, 264 women, and 103 elderly, have been killed, while more than 11100, including 3374 children, 2088 women and 410 elderly, have been injured as a result of Israel’s war on the Palestinians in the Gaza Strip. Eleven Palestinians died of their injuries after the ceasefire agreement was reached.